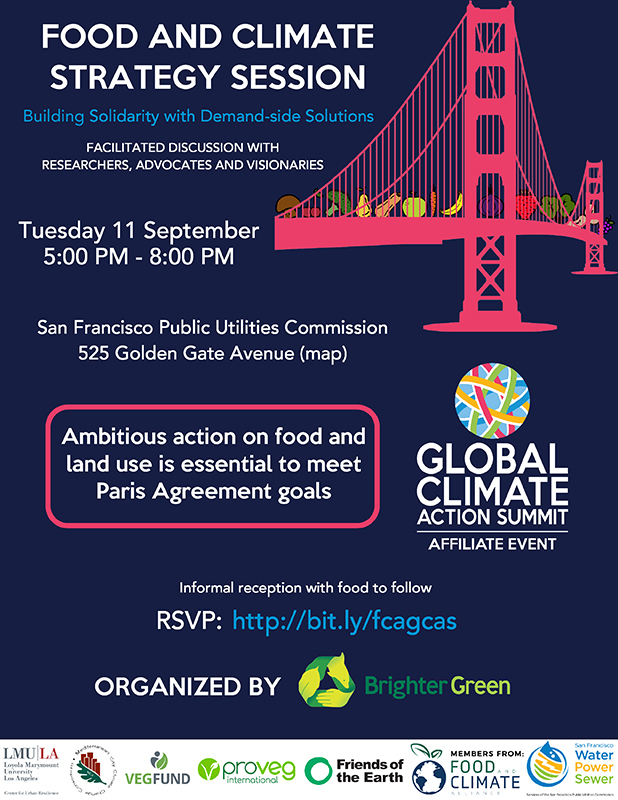 Brighter Green will be at the Global Climate Action Summit (GCAS) in San Francisco from September 12-14th. Beforehand, on the 11th, we will be hosting an Affiliate Event. This event is titled “Food and Climate Strategy Session: Building Solidarity with Demand-side Solutions” and we will be working with Loyola Marymount University, Mediterranean City Climate Change Consortium (MC-4), ProVeg International, Friends of the Earth, and members of the Food and Climate Alliance to put on this strategy session. We look to have a fruitful, facilitated discussion, framed by a few short introductory presentations by technical experts and change-makers. We seek to engage, link, and find ways to collaborate and push forward ambitious climate action in the food, agriculture, and land use sector, by focusing on mitigation and co-benefits from shifting diets (specifically in populations that are over-consuming). Together we’ll dive into difficult questions and seek to develop cross-sectoral strategies (global, national, sub-national, and local) that move forward shifting diets as a climate change mitigation strategy, highlighting the role of meat and other animal-based products, as well as feed. Participation from different disciplines, especially individuals/organizations from the global South, is welcome and encouraged. The event will include an informal reception featuring creative, climate-friendly food. Event is open, but RSVP highly encouraged to ensure seating availability (RSVP here: http://bit.ly/fcagcas).